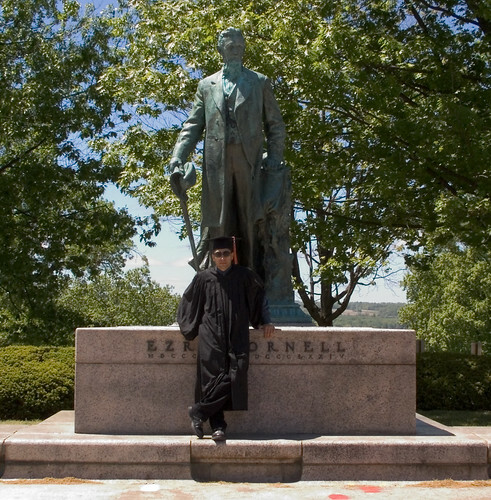 I think is it bizarre that, as of the time of this writing, nearly 2.5 thousand people have wanted to see a photo of my standing in front of a statue of Ezra Cornell. After Danielle and I got out cap and gown, we thought about what a circus it would be on graduation day. Everyone and their 20 family members would probably be trying to get family photos by all the famous Cornell landmarks. So we went around campus and took a series of photos, most of which are just sitting on my hard drive. One of the ones I took of Danielle ended up becoming her “official” graduation photo. Sometimes I wish I’d done more at Cornell, but I couldn’t have done much more and still graduated with an Electrical Engineering degree.